If you believe Russia, President Recep Tayyip Erdoğan of Turkey is the kingpin of a multi-billion-dollar scheme to smuggle 200,000 barrels of Islamic State oil every day, disguising it and exporting it to international markets. Last week President Vladimir Putin described the volumes as “industrial.” He said Turkey shot down a Russian jet on November 24 to protect ISIS oil on its way to “ports where it is shipped out in tankers”. It’s true Turkey has long been accused of complacency when it comes to the self-proclaimed Islamic State. Turkey’s NATO allies regularly call for it to do more, including sealing the border with Syria. But Moscow accused Ankara of something more sinister: state sponsorship of a genocidal terrorist group that’s tearing Iraq and Syria apart and attacking foreign capitals with suicide bombers. Russia’s Defense Ministry leveled more explosive charges at a flashy December 2 press conference. “According to information we’ve received, the senior political leadership of the country—President Erdogan and his family—are involved in this criminal business,” Deputy Defense Minister Anatoly Antonov said. Pictures of trucks in long lines, oil fields, and border crossings were displayed behind him, implying that every truck entering Turkey carried ISIS oil. Russia’s accusations point to one basic question: Who really buys ISIS oil? Turkey doesn’t rank high on that list. The awkward truth is that the Assad regime, which Russia is backing to the hilt, ranks higher. The majority of ISIS oil is purchased by locals inside ISIS territory. ISIS doesn’t operate its own fleet of tanker trucks. That would be a waste of resources and manpower. Instead, the group relies on hundreds of middlemen who provide their own trucks and pay for the oil in cash at ISIS-controlled fields. If the Islamic State was any other country, we’d call these truckers independent businessmen. In the industry we call them “midstream” service providers. They simply move the stuff for profit. With few exceptions, these backyard refineries are just stills in which small batches of oil are heated and the resulting vapor is condensed into low-grade fuel. The owners, usually desperate Arab families who don’t belong to ISIS, run several at a time. The work is dirty and dangerous; the scene is apocalyptic. Toxic plumes of black smoke, scorched earth, soot, and explosions make Mad Max look tame. Hundreds if not thousands of these stills are now active across Syria. Combined, they provide tens of thousands of barrels in daily refining capacity. Fuel from these refineries is sold at roadside pumping stations or in bulk to middlemen who deliver it to population centers where demand is greater. Sound familiar? It should. I’ve just described a public-private partnership. The public sector—i.e., the Islamic State, emphasis on state—controls oil at the source like a national oil company. It sells oil to private traders who sell it to private refiners who sell their product to consumers, directly or indirectly. ISIS involvement in the oil trade is limited to the initial transaction at the field and those tolls, taxes, and fees ISIS can collect inside its territory. The trade appears orderly enough that it’s probably regulated by the Islamic State in other ways. Licensing truckers for certain routes would be an easy way to ensure stable supply whether it’s crude oil or refined products. On December 2, State Department spokesman Mark Toner got it right when he said ISIS “relinquishes ownership” at the wellhead, but it may be a little more complicated. Either way, this public-private partnership is taking advantage of a captive market. Russia’s claim that ISIS smuggles 200,000 barrels a day assumes of course that the group produces that much. In reality, ISIS has never been credited with pumping so much oil. The group’s own internal assessment, retrieved by U.S. commandos during the May raid that killed ISIS oil emir Abu Sayyaf, pegged production at 55,000 barrels a day earlier this year. More recent estimates point to daily output of 40,000 barrels at most. That’s still a lot for a cult that fancies itself a state. But supply is only half the story. More than 5 million people are trapped in ISIS territory, and they could easily consume that amount every day. ISIS is also at war. If it retains any refining capacity for itself, or takes a cut from local refiners, that’s one more customer at home who gets priority. We know ISIS has a discreet arrangement with a neighbor, but it’s not Turkey. The Syrian regime has done business with ISIS from day one, just as it did with al Qaeda’s Nusra Front and other rebels who took over energy assets early in the war. President Bashar al-Assad’s point man for ISIS deals, George Haswani, was first designated by the European Union in March. The U.S. Treasury went a step further with its designation on Nov. 25. In addition to the oil deals, Treasury fingered Haswani’s engineering and construction company (HESCO) for servicing active ISIS fields. Leading up to the most recent wave of airstrikes against ISIS oil targets, U.S. officials admitted the network was more resilient and resourceful than expected. Another Treasury designation in late September hinted that ISIS actually increased oil production this year. They may have had some help from Assad’s man. We don’t know how much oil ISIS has delivered to Assad, but there’s no doubt he needs it. For the first half of 2015, the regime’s oil output was less than 10,000 barrels a day. That was before pro-Assad forces retreated from even more oil-rich territory. All those eyes in the sky over Syria can’t tell how much ISIS oil passes through pipelines to regime-held refineries in the west. There are, however, curious gaps in official data. In April, for instance, Syria’s oil ministry said it refined 106,000 barrels a day, yet trade press could only explain where 85,000 barrels of that oil came from. Data has been increasingly hard to come by since. Besides oil, ISIS delivers natural gas to the regime. These deals are durable because ISIS can’t use it or sell it to anyone else: It must be captured at the source and moved by pipeline. 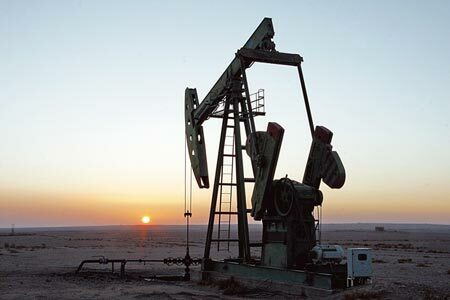 The only users connected to the gas fields are power plants, refineries, and industries, which are concentrated in Assad’s strongholds. In exchange for gas, the regime provides utilities like electricity, which ISIS taxes accordingly. At natural gas fields like those around Palmyra, which produce lighter liquid hydrocarbons in addition to gas, ISIS takes whatever it can turn into fuel. The gas goes west to Assad. By contrast, there’s no proof of an “industrial”-scale ISIS smuggling ring running 200,000 barrels a day through Turkey. “The amount of oil being smuggled is extremely low and has decreased over time and is of no significance from a volume perspective—both volume of oil and volume of revenue,” U.S. special envoy and coordinator for international energy affairs Amos Hochstein said Dec. 4. Trade of that magnitude would be impossible to hide and would have to navigate a patchwork of contested territory. In late 2014, there was ample evidence of fuel smuggling into Turkey—but not crude oil. The distinction matters. Turkey surely has an appetite for cheap diesel because the official grade is so expensive. However, ISIS isn’t selling fuel these days. It’s limited to selling crude oil after losing more than two dozen refineries to airstrikes. Inside Turkey, there’s very little illicit refining capacity, so the chances of selling crude oil there are slim. The state-backed refining monopoly in Turkey would not touch Kurdish oil for the longest time because it was politically sensitive. Knowing the risk, it would never process ISIS oil, contrary to Russia’s claims. Identifying the origin of smuggled fuel and crude oil is extremely difficult when middlemen dominate the scene and the Kurds of northeast Syria run a robust oil trade nearby. In light of the Pentagon’s new mission to cripple ISIS oil, it’s quite possible the Syrian Kurds are producing and exporting (read: smuggling) more than ISIS. Of the three main transit points for ISIS oil identified by Russia’s Defense Ministry, two of those fall in territory where the Kurds are much more active. Meanwhile, the Kurds next door in Iraq, who started independent oil exports last year, are exporting oil by pipeline while trucking heavier crude through Turkey. At least one Kurdish official says the tanker trucks identified by Russia are really carrying oil for the Kurdistan Regional Government. Russia’s spectacular claims don’t match facts on the ground or the reality of smuggling in this part of the world. The only thing that makes sense about this conspiracy theory is the timing. It appears to be a direct result of the Nov. 24 episode in which Russia lost a jet and two servicemen. This isn’t surprising. Russia’s reputation for misinformation is well established, and Moscow doesn’t make distinctions in Syria. In Putin’s eyes, every rebel is ISIS, and every truck carries ISIS oil.